Our trainers have been there. They’ve crawled through damp basements and dusty attics, boiler rooms and skyscraper roofs. They share this intimate knowledge of how buildings work in the courses they teach, and consistently receive rave reviews from their students. Our building science curriculum was one of the first in the US developed specifically to incorporate all aspects of becoming a whole house building performance contractor for existing housing stock, including diagnostic investigation, installation, remediation, as well as a full range of best practices. We deliver courses for beginners as well as advanced certifications. Our roster includes BPI, RESNET and EPA trainings, software end-user classes, and advanced trainings that address the complexities of multifamily and commercial projects. To meet the diverse needs of this quickly growing industry, we offer courses delivered in classrooms, in the field, and through online webinars. Our advanced classes are taught by our expert engineering staff and can be scheduled at your convenience. If you are interested in one of these classes, please contact us at commercialtraining@psdconsulting.com. NREL’s OpenStudio platform for EnergyPlus is changing the way building professionals approach energy modeling – are you prepared for the shift? We offer a variety of OpenStudio support services to help you get there! This 2-day hands-on course will teach students how to generate effective EnergyPlus models quickly and efficiently using the free NREL OpenStudio energy modeling ecosystem. Students will learn how to leverage effective modeling workflows by using Sketchup to construct building form and fabric and assign space classifications and attributes. The OpenStudio application integrates with NREL’s Building Component Library (BCL), providing easy methods for modifying energy models. Model variants can be configured to run in cloud environments (Amazon EC2). Students will also learn how to view summary and detailed output using the OpenStudio Results Manager. This training is aimed at students interested in developing software interfaces for EnergyPlus, Radiance and other tools using the OpenStudio API/SDK. The hands-on training teaches students how to programmatically access the OpenStudio software interface to create and modify building energy models using the Ruby programming language. The class format consists of a series of exercises beginning with creating and saving a new model, then reading results data and making modifications using OpenStudio Measures. Methods, classes and class extensions are covered in great detail. Required Prerequisites: A thorough understanding of the EnergyPlus object model and a basic understanding of programming using scripting languages is required. This course will prepare you to become part of an elite group of Certified Measurement & Verification Professional engineers. As a CMVP, you will serve as a key catalyst for energy efficient retrofits by helping building owners and financiers manage risk and have confidence in the forecasted return on investment. In this course, you’ll learn how to develop and implement Performance Risk Management Plans, and address the six fundamental M&V priciples defined by the Efficiency Valuation Organization’s International Performance Measurement and Verification Protocol (IPMVP). Note: To be eligible for the CMVP certification, you must complete and submit an application to AEE. The purpose of measurement and verification (M&V) is to establish the potential of a project’s measures to save demand and energy and to determine the actual savings produced by those measures. Through presentation and discussion, this course exposes participants to the fundamental principles needed to produce quality M&V. The four IPMVP Options for reporting savings are presented, as well as real-world examples of each. Course For each option, participants will gain an understanding and appreciation for the principals of good M&V – Accurate, Complete, Consistent, Relevant and Transparent. This course does NOT lead to Certified Measurement & Verification Professional (CMVP) certification. This three day instructional program is designed to provide the specific training and background needed by professionals preparing to sit for the Association of Energy Engineers’ (AEE) Building Energy Simulation Analyst (BESA) certification examination. Attendees will gain a clear, in-depth understanding of the theory and practice of computerized building energy modeling, and will conduct hands-on energy simulation exercises using eQUEST® software.PSD is one of only two organizations approved by AEE to offer this training for individuals with expertise in using modeling software.The BESA exam will be administered at the close of instruction on day three of each seminar — only to those who have qualified in advance to sit for the exam by submitted a completed BESA application and fee. This course is designed to help participants better understand how commercial sector performance benchmarking tools such as EPA’s Portfolio Manager (and optionally other tools including PSD’s Building Performance Compass) function and can be used. The course begins by covering sector-wide historical energy performance indicators for key commercial building segments. Next, participants will learn how Portfolio Manager rating models are developed and extensively used. Important Portfolio Manager concepts such as data sharing and access privileges are discussed in detail. Participants are led through hands-on examples of Portfolio Manager Ratings using data from regional buildings to reinforce the concepts covered. Finally, advanced benchmarking concepts for non-energy performance such as water, indoor environmental quality, acoustics and thermal comfort are discussed. An energy analyst armed with both a strong understanding of the fundamental principles behind energy usage and an understanding of how to systematically perform field assessments of lighting, HVAC and motors can quickly begin adding value to their firm’s business. Uniquely designed and adapted to local building types, this course combines morning classroom presentations with afternoon ‘hands-on’ field assessments of real-world energy conservation scenarios. Throughout this course (up to a week in overall duration) students will actively engage in developing credible and defendable energy savings estimates, and learn to present them in easy to understand formats. 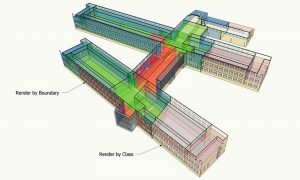 It is generally accepted that using whole building energy modeling tools represents the best-in-class approach for estimating energy savings associated with deep retrofits. This course, designed for practitioners with little energy modeling experience, covers the fundamentals of general energy modeling tools. A software agonistic course, students completing this course will develop a sense for how/when/why and where energy simulation could best be used as a problem-solving tool. The course includes demonstrations of several different simulation/modeling tools and discusses in depth the pros and cons of non-simulation modeling methods such as custom spreadsheets, measure specific spreadsheets and calculators. Designed around the eQUEST energy simulation tool, this course lead practitioners through eQUEST examples of advanced modeling topics such as modeling complex control strategies, developing custom performance curves to represent existing mechanical equipment, modeling complex utility tariff structures, and configuring the energy model as a reporting device to assist in M&V (measurement and verification) activities. This course requires prior modeling experience using eQUEST. Interested? This two-hour webinar will introduce participants to all TREAT multifamily screens and modeling concepts. This two-hour webinar will cover high rise modeling using TREAT multifamily software. To attend this webinar, participants must be well versed in the use of multifamily TREAT (e.g. prior attendance to an in-person training, webinar, etc.). This two-hour webinar will cover low rise modeling using TREAT multifamily software. To attend this webinar, participants must be well versed in the use of multifamily TREAT (e.g. prior attendance to an in-person training, webinar, etc.). This course introduces the functionality of TREAT building modeling software, and will teach techniques to speed the modeling process for even experienced TREAT single family modelers. The instructor will review core concepts of the software and create a sample building energy model as part of the class. Upon completion, students should have the ability to use TREAT for one to four family energy audits. This is a two-day course that introduces new users to the functionality of the TREAT building modeling software, and will teach techniques to speed the modeling process for even experienced TREAT single family modelers. The instructor will review core concepts of the software and students will create their own model as a class exercise. Upon completion, students will have the ability to use TREAT for one to four family energy audits. This includes modeling, health and safety tracking, basic utility bill true-up, the creation of improvements, packaging improvements and creating reports. Students must bring a laptop that has TREAT software already installed and registered. Day two delves into advanced features of TREAT (including billing analysis). Students should have completed at least one single-family model prior to day two of the training, and are invited to bring actual TREAT models to the class for discussion. Upon completion, users will understand the full capabilities of TREAT and how to effectively incorporate them into a working business model. Students must bring a laptop that has TREAT software already installed and registered. A three-day classroom training on the multifamily version of the TREAT modeling software. This is a class in our monthly educational webinar series for raters. These webinars will generally take place on the third Tuesday of each month and consist of one and a half hours of presentation and 30 minutes of question and answer on topics relevant to HERS Raters. The webinars will be presented by Emelie Cuppernell and Ethan MacCormick. This training will cover the new requirements of ENERGY STAR for New Homes version 3 program. The training will include an ENERGY STAR v3 Overview, Thermal Enclosure Rater Checklist, HVAC Quality Installation Rater Checklist, Water Management Builder Checklist, and question answer sessions. At the conclusion of the training each participant will take an online test to qualify for the completion certificate. This training is approved for 18 hours of RESNET Professional Development Credits and 4 BPI continuing education credits. All online sessions will be recorded for later viewing. This training will familiarize participants with the process and science of conducting an energy rating, and prepare you to successfully pass the HERS certification test and perform ratings of newly built houses. The course will examine “the house as a system,” including energy and moisture transfer, the thermal envelope, air leakage problems and solutions, ventilation and indoor air quality, windows, as well as basic energy load calculations, and diagnostic testing using a blower door, infrared thermography, and a duct blaster. Following the class, students will apply for certification with an accredited Home Energy Rating System (HERS) provider. Six days of training and testing, including both classroom and field work forms a comprehensive training experience that is accredited through the Residential Energy Services Network. 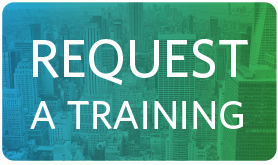 This 4 hour training will satisfy the RESNET CAZ field Training requirement for continued Certification as a HERS Rater. This training pairs nicely with our online training and offers hands-on experience with Combustion Appliance Zone test equipment and house configuration. Student will participate in identifying the CAZ, setting up equipment, and configure the home for the worst case depressurization test. Learn how fans, ductwork, and door configuration can all impact the test and how this can be measured. We will test for gas leakage, CO, and spillage per the RESNET protocol. To be eligible to install HVAC equipment in ENERGY STAR certified homes, HVAC contractors are now required to be credentialed through an EPA-recognized independent, third party organization. Please join us for orientation and technical training where we will provide you with the proper level of training on the ENERGY STAR program, the QAP program, and the technical aspects of HVAC needed to perform quality design, install, and start-up functions on ENERGY STAR Certified New Homes program jobs. The course is designed to increase your compliance with ENERGY STAR V3 through a robust QC/QA process. 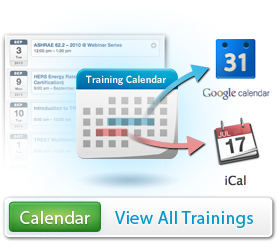 This course was created to instruct you on what ENERGY STAR V3 is requiring, how to fill out the HVAC System QI Checklist and how to participate in the QAP program. The key to energy-efficient building performance is in understanding the integrated systems in a building that are responsible for the transfer and use of energy, for moisture transport, and air movement. This training is intended for anyone who would like to conduct diagnostic energy audits on existing housing stock, including measurement and verification services related to building analysis. This course is a carefully crafted balance of classroom presentations, field exercises, and self-study materials. Theory and practice are integrated with an emphasis on practical problem-solving – culminating in Building Analyst (BA1) certification through the Building Performance Institute. The key to energy-efficiency in a multi-family building is understanding the integrated system components, and the physics that drive them. This training is geared towards preparing you for the Multi-Family Building Analyst (MFBA) certification exam – with the ultimate goal of optimizing building performance for energy efficiency. The topics will focus the participants on conducting diagnostic energy assessments for multi-family buildings with more than 4 units. This course is a carefully crafted series of classroom presentations, with an emphasis on practical problem-solving. Course registration includes all fees to the Building Performance Institute. Field mentoring is an additional cost and will be scheduled separately.